The Sunflower Bracket in Chrome has a traditional appearance, lovingly crafted and hand finished with exceptional care using the finest materials and manufacturing processes. 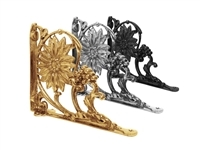 The Sunflower Bracket in Brass has a traditional appearance, lovingly crafted and hand finished with exceptional care using the finest materials and manufacturing processes. The Coalbrookdale 12x10 Bracket in Chrome has a traditional appearance, lovingly crafted and hand finished with exceptional care using the finest materials and manufacturing processes. The Coalbrookdale 7x7 Bracket in Chrome has a traditional appearance, lovingly crafted and hand finished with exceptional care using the finest materials and manufacturing processes. 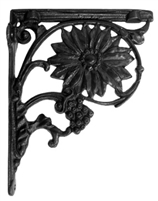 The Sunflower Bracket in Cast Iron has a traditional appearance, lovingly crafted and hand finished with exceptional care using the finest materials and manufacturing processes. The Heritage Bracket in Chrome has a traditional appearance, lovingly crafted and hand finished with exceptional care using the finest materials and manufacturing processes. 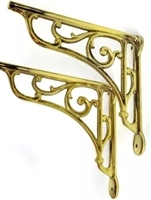 The Heritage Bracket in Brass has a traditional appearance, lovingly crafted and hand finished with exceptional care using the finest materials and manufacturing processes. The Heritage Bracket in Cast Iron has a traditional appearance, lovingly crafted and hand finished with exceptional care using the finest materials and manufacturing processes.